Leisure Travel Vans by Triple E has created a more comfortable livable space with fewer disputes. They skipped the usual convertible dinette set and created the new Leisure Lounge Plus. The cozy lounge area features multi-adjustable recliners, a fold-out table and a drop-down Murphy bed to better the comfortable living, dining, sleeping and showering experiences of home. Leisure Travel has been offering the Unity MB (Murphy Bed) since 2009. The use of the drop-down wall bed is a way to conserve space. The Murphy bed allows owners to sleep comfortably at night and quickly store the bed neatly into the wall when it's not in use which opens up that floor space in the daytime. 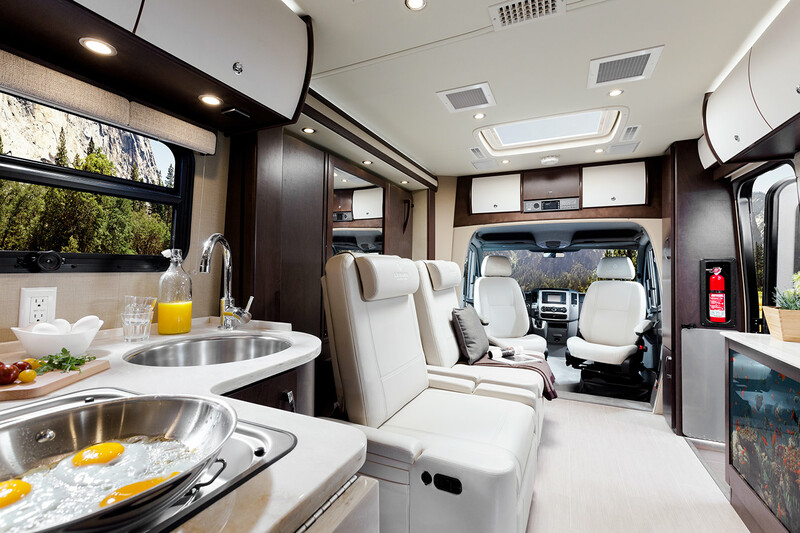 Leisure Travel Van takes its Murphy bed design to a new level for the 2016 model year in combining it into the available new Leisure Lounge Plus. The Leisure Lounge Plus revolves around two oversized ultra leather electric recliners. The recliners swivel 90 degrees and include pop-out armrests, along with their powered footrests. The recliners also have built-in USB ports. The electric wall slide-out behind the chairs provides the added space needed to kick back and recline. The Leisure Lounge Plus looks like a comfy TV room when the recliners are facing directly out but it quickly transforms into both the dining room and bedroom. A fold-out dining table drops down from inside the mirrored cabinet on the wall and the recliners swivel around to seat two at the table. At night, the backs of the recliners fold flat manually to support the Murphy bed also concealed in the driver-side wall. The area at the head of the bed includes windows, built-in lights and USB ports. When the wall slide-out is in use, sleepers have enough space to walk around the bed to the kitchen and bathroom. A safety cover ensures they don't step into the stairwell of the exterior door. Another feature of the new lounge layout is the dual-view 39-in LED TV. The TV sits behind the glass face of the passenger-side wall console and can also lift up to stand at the top of the console, providing two different viewing angles to make watching TV more comfortable. The Murphy bed and Leisure Lounge Plus open up the interior, which Leisure Travel takes advantage of in adding a sizeable rear bathroom. It has an enclosed corner shower, a vanity sink, a porcelain toilet and floor space. The kitchen has a two-burner cook top, refrigerator/freezer, stainless steel sink, stainless steel convection microwave, small recessed garbage can, countertop with flip-up extension, and plenty of pantry, cabinet and drawer storage. It also includes a 15,000 BTU air conditioning unit, 16,000 BTU furnace, kitchen fan, dual 6 V deep cycle batteries, a 1,200-watt inverter, a water heater, 30-gal fresh water tank, DVD/CD stereo system with Bluetooth, slide-out awning with integrated LED lights, 55 cu ft of exterior storage, and skylight with screen and privacy shade. Solar panels and generators are available as options. The Unity 24MB features an aluminum framed gel coat fiberglass shell atop a Mercedes-Benz Sprinter 3500 chassis. That platform comes with a 188-hp/325 lb-ft 3.0-liter V6 turbo diesel engine, five-speed automatic transmission and dual rear wheels. The two front seats are ultra leather swivel seats. The Murphy Bed model itself is one of four Unity floor plans. View our New Leisure Travel Van Motorhomes for sale, or feel free to browse our entire New or Used RV inventory. 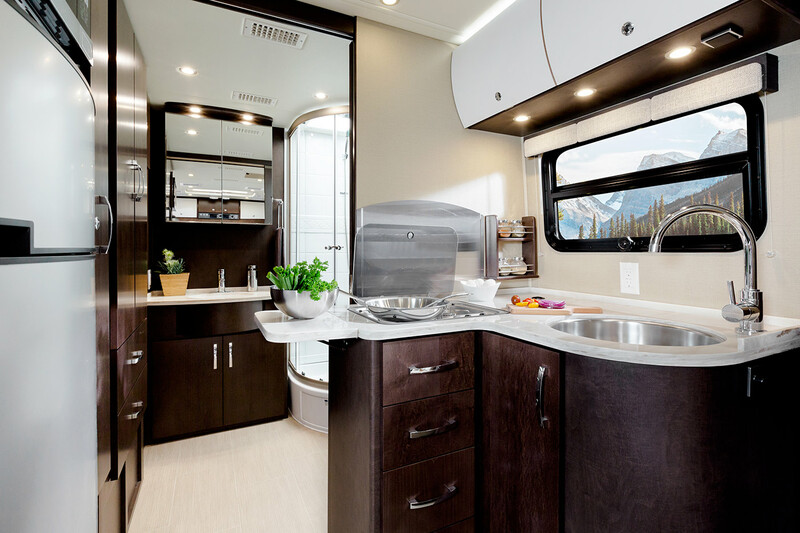 Fretz RV is one of the top 3 Leisure Travel Van dealers in North America. We try to keep a large inventory of Leisure Travel product for customers to compare.